Corporate Assets Inc. | LDL Excavation - Corporate Assets Inc. 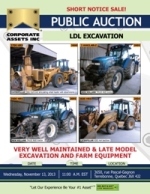 VERY WELL MAINTAINED & LATE MODEL EXCAVATION AND FARM EQUIPMENT FEATURING: NEW HOLLAND (2005) TM155 4 wheel drive tractor with LOW HOURS and attachments; (2) NEW HOLLAND (2005) TM120 4 wheel drive tractors with LOW HOURS and attachments; CATERPILLAR (2004) 420D 4x4 backhoe; CATERPILLAR (2000) 938G front end articulating wheel loader; CATERPILLAR (1999) 938G front end articulating wheel loader; MULTIPLE ATTACHMENTS FOR LOADERS & TRACTORS CONSISTING OF PLOWS, COMPACTORS, BUCKETS, HAMMERS & MORE! ; TWIN DISC heavy duty snow blower attachment, multiple single and double auger snow blowing attachments, (15+) bucket and plow attachments (some late model); GMC 3500 cube van; Dual axle dump and flatbed trailers, dump trucks, salt trucks, flatbed trucks, pick-up trucks, hot pressure washer, air compressor, welders and portable job site equipment, cement mixers, wheel barrels, power tools, hardware & MORE!